The Universe is all of time and space and its contents. It includes planets, moons, minor planets, stars, galaxies, the contents of intergalactic space, and all matter and energy. The size of the entire Universe is unknown. The earliest scientific models of the Universe were developed by ancient Greek and Indian philosophers and were geocentric, placing Earth at the center of the Universe. Over the centuries, more precise astronomical observations led Nicolaus Copernicus (1473–1543) to develop the heliocentric model with the Sun at the center of the Solar System. In developing the law of universal gravitation, Sir Isaac Newton (NS: 1643–1727) built upon Copernicus’s work as well as observations by Tycho Brahe (1546–1601) and Johannes Kepler’s (1571–1630) laws of planetary motion. Further observational improvements led to the realization that our Solar System is located in the Milky Way galaxy, which is one of many galaxies in the Universe. It is assumed that galaxies are distributed uniformly and the same in all directions, meaning that the Universe has neither an edge nor a center. Discoveries in the early 20th century have suggested that the Universe had a beginning and that it is expanding at an increasing rate. The majority of mass in the Universe appears to exist in an unknown form called dark matter. The Big Bang theory is the prevailing cosmological description of the development of the Universe. Under this theory, space and time emerged together 13.799±0.021 billion years ago with a fixed amount of energy and matter that has become less dense as the Universe has expanded. After the initial expansion, the Universe cooled, allowing the first subatomic particles to form and then simple atoms. Giant clouds later merged through gravity to form galaxies, stars, and everything else seen today. The Universe can be defined as everything that exists, everything that has existed, and everything that will exist.According to our current understanding, the Universe consists of spacetime, forms of energy (including electromagnetic radiation and matter), and the physical laws that relate them. The Universe encompasses all of life, all of history, and some philosophers and scientists suggest that it even encompasses ideas such as mathematics and logic. The word universe derives from the Old French word univers, which in turn derives from the Latin word universum. The Latin word was used by Cicero and later Latin authors in many of the same senses as the modern English word is used. A term for “universe” among the ancient Greek philosophers from Pythagoras onwards was τὸ πᾶν tò pân (“the all”), defined as all matter and all space, and τὸ ὅλον tò hólon (“all things”), which did not necessarily include the void. Another synonym was ὁ κόσμος ho kósmos (meaning the world, the cosmos). Synonyms are also found in Latin authors (totum, mundus, natura) and survive in modern languages, e.g., the German words Das All, Weltall, and Natur for Universe. The same synonyms are found in English, such as everything (as in the theory of everything), the cosmos (as in cosmology), the world (as in the many-worlds interpretation), and nature (as in natural laws or natural philosophy). The prevailing model for the evolution of the Universe is the Big Bang theory. The Big Bang model states that the earliest state of the Universe was extremely hot and dense and that it subsequently expanded. The model is based on general relativity and on simplifying assumptions such as homogeneity and isotropy of space. A version of the model with a cosmological constant (Lambda) and cold dark matter, known as the Lambda-CDM model, is the simplest model that provides a reasonably good account of various observations about the Universe. The Big Bang model accounts for observations such as the correlation of distance and redshift of galaxies, the ratio of the number of hydrogen to helium atoms, and the microwave radiation background. In this diagram, time passes from left to right, so at any given time, the Universe is represented by a disk-shaped “slice” of the diagram. The initial hot, dense state is called the Planck epoch, a brief period extending from time zero to one Planck time unit of approximately 10−43 seconds. During the Planck epoch, all types of matter and all types of energy were concentrated into a dense state, where gravitation is believed to have been as strong as the other fundamental forces, and all the forces may have been unified. Since the Planck epoch, the Universe has been expanding to its present form, possibly with a very brief period of cosmic inflation which caused the Universe to reach a much larger size in less than 10−32 seconds. After the Planck epoch and inflation came the quark, hadron, and lepton epochs. Together, these epochs encompassed less than 10 seconds of time following the Big Bang. The observed abundance of the elements can be explained by combining the overall expansion of space with nuclear and atomic physics. As the Universe expands, the energy density of electromagnetic radiation decreases more quickly than does that of matter because the energy of a photon decreases with its wavelength. As the Universe expanded and cooled, elementary particles associated stably into ever larger combinations. Thus, in the early part of the matter-dominated era, stable protons and neutrons formed, which then formed atomic nuclei through nuclear reactions. This process, known as Big Bang nucleosynthesis, led to the present abundances of lighter nuclei, particularly hydrogen, deuterium, and helium. Big Bang nucleosynthesis ended about 20 minutes after the Big Bang, when the Universe had cooled enough so that nuclear fusion could no longer occur. At this stage, matter in the Universe was mainly a hot, dense plasma of negatively charged electrons, neutral neutrinos and positive nuclei. This era, called the photon epoch, lasted about 380 thousand years. Eventually, at a time known as recombination, electrons and nuclei formed stable atoms, which are transparent to most wavelengths of radiation. With photons decoupled from matter, the Universe entered the matter-dominated era. Light from this era could travel freely, and it can still be seen in the Universe as the cosmic microwave background (CMB). After around 100 million years, the first stars formed; these were likely very massive, luminous, and responsible for the reionization of the Universe. Having no elements heavier than lithium, these stars also produced the first heavy elements through stellar nucleosynthesis. The Universe also contains a mysterious energy called dark energy,the density of which does not change over time. After about 9.8 billion years, the Universe had expanded sufficiently so that the density of matter was less than the density of dark energy, marking the beginning of the present dark-energy-dominated era. In this era, the expansion of the Universe is accelerating due to dark energy. The spacetime of the Universe is usually interpreted from a Euclidean perspective, with space as consisting of three dimensions, and time as consisting of one dimension, the “fourth dimension”. By combining space and time into a single manifold called Minkowski space, physicists have simplified a large number of physical theories, as well as described in a more uniform way the workings of the Universe at both the supergalactic and subatomic levels. Spacetime events are not absolutely defined spatially and temporally but rather are known relative to the motion of an observer. Minkowski space approximates the Universe without gravity; the pseudo-Riemannian manifolds of general relativity describe spacetime with matter and gravity. String theory postulates the existence of additional dimensions. Of the four fundamental interactions, gravitation is dominant at cosmological length scales, including galaxies and larger-scale structures. Gravity’s effects are cumulative; by contrast, the effects of positive and negative charges tend to cancel one another, making electromagnetism relatively insignificant on cosmological length scales. The remaining two interactions, the weak and strong nuclear forces, decline very rapidly with distance; their effects are confined mainly to sub-atomic length scales. The Universe appears to have much more matter than antimatter, an asymmetry possibly related to the observations of CP violation. The Universe also appears to have neither net momentum nor angular momentum. The absence of net charge and momentum would follow from accepted physical laws (Gauss’s law and the non-divergence of the stress-energy-momentum pseudotensor, respectively) if the Universe were finite. This diagram shows Earth’s location in the Universe. The three possible options of the shape of the Universe. General relativity describes how spacetime is curved and bent by mass and energy. The topology or geometry of the Universe includes both local geometry in the observable universe and global geometry. Cosmologists often work with a given space-like slice of spacetime called the comoving coordinates. The section of spacetime which can be observed is the backward light cone, which delimits the cosmological horizon. The cosmological horizon (also called the particle horizon or the light horizon) is the maximum distance from which particles can have traveled to the observer in the age of the Universe. This horizon represents the boundary between the observable and the unobservable regions of the Universe. The existence, properties, and significance of a cosmological horizon depend on the particular cosmological model. An important parameter determining the future evolution of the Universe theory is the density parameter, Omega (Ω), defined as the average matter density of the universe divided by a critical value of that density. This selects one of three possible geometries depending on whether Ω is equal to, less than, or greater than 1. These are called, respectively, the flat, open and closed universes. Observations, including the Cosmic Background Explorer (COBE), Wilkinson Microwave Anisotropy Probe (WMAP), and Planck maps of the CMB, suggest that the Universe is infinite in extent with a finite age, as described by the Friedmann–Lemaître–Robertson–Walker (FLRW) models. These FLRW models thus support inflationary models and the standard model of cosmology, describing a flat, homogeneous universe presently dominated by dark matter and dark energy. The size of the Universe is somewhat difficult to define. According to a restrictive definition, the Universe is everything within our connected spacetime that could have a chance to interact with us and vice versa. According to the general theory of relativity, some regions of space may never interact with ours even in the lifetime of the Universe due to the finite speed of light and the ongoing expansion of space. For example, radio messages sent from Earth may never reach some regions of space, even if the Universe were to exist forever: space may expand faster than light can traverse it. Distant regions of space are assumed to exist and to be part of reality as much as we are, even though we can never interact with them. The spatial region that we can affect and be affected by is the observable universe. The observable universe depends on the location of the observer. By traveling, an observer can come into contact with a greater region of spacetime than an observer who remains still. Nevertheless, even the most rapid traveler will not be able to interact with all of space. Typically, the observable universe is taken to mean the portion of the Universe that is observable from our vantage point in the Milky Way. The proper distance—the distance as would be measured at a specific time, including the present—between Earth and the edge of the observable universe is 46 billion light-years (14 billion parsecs), making the diameter of the observable universe about 91 billion light-years (28×109 pc). The distance the light from the edge of the observable universe has travelled is very close to the age of the Universe times the speed of light, 13.8 billion light-years (4.2×109 pc), but this does not represent the distance at any given time because the edge of the observable universe and the Earth have since moved further apart. For comparison, the diameter of a typical galaxy is 30,000 light-years (9,198 parsecs), and the typical distance between two neighboring galaxies is 3 million light-years. (919.8 million parsecs), As an example, the Milky Way is roughly 100,000 light years in diameter, and the nearest sister galaxy to the Milky Way, the Andromeda Galaxy, is located roughly 2.5 million light years away. Because we cannot observe space beyond the edge of the observable universe, it is unknown whether the size of the Universe is finite or infinite. Astronomers calculate the age of the Universe by assuming that the Lambda-CDM model accurately describes the evolution of the Universe from a very uniform, hot, dense primordial state to its present state and measuring the cosmological parameters which constitute the model. This model is well understood theoretically and supported by recent high-precision astronomical observations such as WMAP and Planck. Commonly, the set of observations fitted includes the cosmic microwave background anisotropy, the brightness/redshift relation for Type Ia supernovae, and large-scale galaxy clustering including the baryon acoustic oscillation feature. Other observations, such as the Hubble constant, the abundance of galaxy clusters, weak gravitational lensing and globular cluster ages, are generally consistent with these, providing a check of the model, but are less accurately measured at present. With the prior that the Lambda-CDM model is correct, the measurements of the parameters using a variety of techniques by numerous experiments yield a best value of the age of the Universe as of 2015 of 13.799 ± 0.021 billion years. Over time, the Universe and its contents have evolved; for example, the relative population of quasars and galaxies has changed and space itself has expanded. Due to this expansion, scientists on Earth can observe the light from a galaxy 30 billion light years away even though that light has traveled for only 13 billion years; the very space between them has expanded. This expansion is consistent with the observation that the light from distant galaxies has been redshifted; the photons emitted have been stretched to longer wavelengths and lower frequency during their journey. Analyses of Type Ia supernovae indicate that the spatial expansion is accelerating. The more matter there is in the Universe, the stronger the mutual gravitational pull of the matter. If the Universe were too dense then it would re-collapse into a gravitational singularity. However, if the Universe contained too little matter then the expansion would accelerate too rapidly for planets and planetary systems to form. Since the Big Bang, the universe has expanded monotonically. Perhaps unsurprisingly, our universe has just the right mass density of about 5 protons per cubic meter which has allowed it to expand for the last 13.8 billion years, giving time to form the universe as observed today. There are dynamical forces acting on the particles in the Universe which affect the expansion rate. Before 1998, it was expected that the rate of increase of the Hubble Constant would be decreasing as time went on due to the influence of gravitational interactions in the Universe, and thus there is an additional observable quantity in the Universe called the deceleration parameter which cosmologists expected to be directly related to the matter density of the Universe. In 1998, the deceleration parameter was measured by two different groups to be consistent with −1 but not zero, which implied that the present-day rate of increase of the Hubble Constant is increasing over time. Spacetimes are the arenas in which all physical events take place—an event is a point in spacetime specified by its time and place. The basic elements of spacetime are events. In any given spacetime, an event is a unique position at a unique time. Because events are spacetime points, in classical relativistic physics, the location of an elementary (point-like) particle at a particular time can be written as (x, y, z, t). A spacetime is the union of all events in the same way that a line is the union of all of its points, formally organized into a manifold. The Universe appears to be a smooth spacetime continuum consisting of three spatial dimensions and one temporal (time) dimension. On the average, space is observed to be very nearly flat (close to zero curvature), meaning that Euclidean geometry is empirically true with high accuracy throughout most of the Universe. Spacetime also appears to have a simply connected topology, in analogy with a sphere, at least on the length-scale of the observable Universe. However, present observations cannot exclude the possibilities that the Universe has more dimensions and that its spacetime may have a multiply connected global topology, in analogy with the cylindrical or toroidal topologies of two-dimensional spaces. The formation of clusters and large-scale filaments in the Cold Dark Matter model with dark energy. The frames show the evolution of structures in a 43 million parsecs (or 140 million light years) box from redshift of 30 to the present epoch (upper left z=30 to lower right z=0). The Universe is composed almost completely of dark energy, dark matter, and ordinary matter. Other contents are electromagnetic radiation (estimated to be from 0.005% to close to 0.01%) and antimatter. The total amount of electromagnetic radiation generated within the universe has decreased by 1/2 in the past 2 billion years. The proportions of all types of matter and energy have changed over the history of the Universe. Today, ordinary matter, which includes atoms, stars, galaxies, and life, accounts for only 4.9% of the contents of the Universe. The present overall density of this type of matter is very low, roughly 4.5 × 10−31 grams per cubic centimetre, corresponding to a density of the order of only one proton for every four cubic meters of volume. The nature of both dark energy and dark matter is unknown. Dark matter, a mysterious form of matter that has not yet been identified, accounts for 26.8% of the contents. Dark energy, which is the energy of empty space and that is causing the expansion of the Universe to accelerate, accounts for the remaining 68.3% of the contents. Matter, dark matter, and dark energy are distributed homogeneously throughout the Universe over length scales longer than 300 million light-years or so. However, over shorter length-scales, matter tends to clump hierarchically; many atoms are condensed into stars, most stars into galaxies, most galaxies into clusters, superclusters and, finally, large-scale galactic filaments. The observable Universe contains approximately 300 sextillion (3×1023) stars and more than 100 billion (1011) galaxies. Typical galaxies range from dwarfs with as few as ten million (107) stars up to giants with one trillion (1012) stars. Between the structures are voids, which are typically 10–150 Mpc (33 million–490 million ly) in diameter. The Milky Way is in the Local Group of galaxies, which in turn is in the Laniakea Supercluster. This supercluster spans over 500 million light years, while the Local Group spans over 10 million light years. The Universe also has vast regions of relative emptiness; the largest known void measures 1.8 billion ly (550 Mpc) across. Comparison of the contents of the Universe today to 380,000 years after the Big Bang as measured with 5 year WMAP data (from 2008). (Due to rounding errors, the sum of these numbers is not 100%). This reflects the 2008 limits of WMAP’s ability to define Dark Matter and Dark Energy. The observable Universe is isotropic on scales significantly larger than superclusters, meaning that the statistical properties of the Universe are the same in all directions as observed from Earth. The Universe is bathed in highly isotropic microwave radiation that corresponds to a thermal equilibrium blackbody spectrum of roughly 2.72548 kelvin. The hypothesis that the large-scale Universe is homogeneous and isotropic is known as the cosmological principle. A Universe that is both homogeneous and isotropic looks the same from all vantage points and has no center. An explanation for why the expansion of the Universe is accelerating remains elusive. It is often attributed to “dark energy”, an unknown form of energy that is hypothesized to permeate space. On a mass–energy equivalence basis, the density of dark energy (~ 7 × 10−30 g/cm3) is much less than the density of ordinary matter or dark matter within galaxies. However, in the present dark-energy era, it dominates the mass–energy of the universe because it is uniform across space. Two proposed forms for dark energy are the cosmological constant, a constant energy density filling space homogeneously, and scalar fields such as quintessence or moduli, dynamic quantities whose energy density can vary in time and space. Contributions from scalar fields that are constant in space are usually also included in the cosmological constant. The cosmological constant can be formulated to be equivalent to vacuum energy. Scalar fields having only a slight amont of spatial inhomogeneity would be difficult to distinguish from a cosmological constant. Dark matter is a hypothetical kind of matter that is invisible to the entire electromagnetic spectrum, but which accounts for most of the matter in the Universe. The existence and properties of dark matter are inferred from its gravitational effects on visible matter, radiation, and the large-scale structure of the Universe. Other than neutrinos, a form of hot dark matter, dark matter has not been detected directly, making it one of the greatest mysteries in modern astrophysics. Dark matter neither emits nor absorbs light or any other electromagnetic radiation at any significant level. Dark matter is estimated to constitute 26.8% of the total mass–energy and 84.5% of the total matter in the Universe. The remaining 4.9% of the mass–energy of the Universe is ordinary matter, that is, atoms, ions, electrons and the objects they form. This matter includes stars, which produce nearly all of the light we see from galaxies, as well as interstellar gas in the interstellar and intergalactic media, planets, and all the objects from everyday life that we can bump into, touch or squeeze. As a matter of fact, the great majority of ordinary matter in the universe is unseen, since visible stars and gas inside galaxies and clusters account for less than 10 per cent of the ordinary matter contribution to the mass-energy density of the universe. Ordinary matter commonly exists in four states (or phases): solid, liquid, gas, and plasma. However, advances in experimental techniques have revealed other previously theoretical phases, such as Bose–Einstein condensates and fermionic condensates. Ordinary matter is composed of two types of elementary particles: quarks and leptons. For example, the proton is formed of two up quarks and one down quark; the neutron is formed of two down quarks and one up quark; and the electron is a kind of lepton. An atom consists of an atomic nucleus, made up of protons and neutrons, and electrons that orbit the nucleus. Because most of the mass of an atom is concentrated in its nucleus, which is made up of baryons, astronomers often use the term baryonic matter to describe ordinary matter, although a small fraction of this “baryonic matter” is electrons. Soon after the Big Bang, primordial protons and neutrons formed from the quark–gluon plasma of the early Universe as it cooled below two trillion degrees. A few minutes later, in a process known as Big Bang nucleosynthesis, nuclei formed from the primordial protons and neutrons. This nucleosynthesis formed lighter elements, those with small atomic numbers up to lithium and beryllium, but the abundance of heavier elements dropped off sharply with increasing atomic number. Some boron may have been formed at this time, but the next heavier element, carbon, was not be formed in significant amounts. Big Bang nucleosynthesis shut down after about 20 minutes due to the rapid drop in temperature and density of the expanding Universe. Subsequent formation of heavier elements resulted from stellar nucleosynthesis and supernova nucleosynthesis. Standard model of elementary particles: the 12 fundamental fermions and 4 fundamental bosons. Brown loops indicate which bosons (red) couple to which fermions (purple and green). Columns are three generations of matter (fermions) and one of forces (bosons). In the first three columns, two rows contain quarks and two leptons. 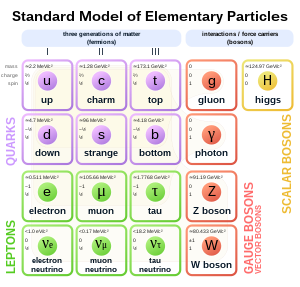 The top two rows’ columns contain up (u) and down (d) quarks, charm (c) and strange (s) quarks, top (t) and bottom (b) quarks, and photon (γ) and gluon (g), respectively. The bottom two rows’ columns contain electron neutrino (νe) and electron (e), muon neutrino (νμ) and muon (μ), tau neutrino (ντ) and tau (τ), and the Z0 and W± carriers of the weak force. Mass, charge, and spin are listed for each particle. Ordinary matter and the forces that act on matter can be described in terms of elementary particles. These particles are sometimes described as being fundamental, since they have an unknown substructure, and it is unknown whether or not they are composed of smaller and even more fundamental particles. Of central importance is the Standard Model, a theory that is concerned with electromagnetic interactions and the weak and strong nuclear interactions. The Standard Model is supported by the experimental confirmation of the existence of particles that compose matter: quarks and leptons, and their corresponding “antimatter” duals, as well as the force particles that mediate interactions: the photon, the W and Z bosons, and the gluon. The Standard Model predicted the existence of the recently discovered Higgs boson, a particle that is a manifestation of a field within the Universe that can endow particles with mass. Because of its success in explaining a wide variety of experimental results, the Standard Model is sometimes regarded as a “theory of almost everything”. The Standard Model does not, however, accommodate gravity. A true force-particle “theory of everything” has not been attained. A lepton is an elementary, half-integer spin particle that does not undergo strong interactions but is subject to the Pauli exclusion principle; no two leptons of the same species can be in exactly the same state at the same time. Two main classes of leptons exist: charged leptons (also known as the electron-like leptons), and neutral leptons (better known as neutrinos). Electrons are stable and the most common charged lepton in the Universe, whereas muons and taus are unstable particle that quickly decay after being produced in high energy collisions, such as those involving cosmic rays or carried out in particle accelerators. Charged leptons can combine with other particles to form various composite particles such as atoms and positronium. The electron governs nearly all of chemistry, as it is found in atoms and is directly tied to all chemical properties. Neutrinos rarely interact with anything, and are consequently rarely observed. Neutrinos stream throughout the Universe but rarely interact with normal matter. The lepton epoch was the period in the evolution of the early Universe in which the leptons dominated the mass of the Universe. It started roughly 1 second after the Big Bang, after the majority of hadrons and anti-hadrons annihilated each other at the end of the hadron epoch. During the lepton epoch the temperature of the Universe was still high enough to create lepton/anti-lepton pairs, so leptons and anti-leptons were in thermal equilibrium. Approximately 10 seconds after the Big Bang, the temperature of the Universe had fallen to the point where lepton/anti-lepton pairs were no longer created. Most leptons and anti-leptons were then eliminated in annihilation reactions, leaving a small residue of leptons. The mass of the Universe was then dominated by photons as it entered the following photon epoch. A photon is the quantum of light and all other forms of electromagnetic radiation. It is the force carrier for the electromagnetic force, even when static via virtual photons. The effects of this force are easily observable at the microscopic and at the macroscopic level because the photon has zero rest mass; this allows long distance interactions. Like all elementary particles, photons are currently best explained by quantum mechanics and exhibit wave–particle duality, exhibiting properties of waves and of particles. The photon epoch started after most leptons and anti-leptons were annihilated at the end of the lepton epoch, about 10 seconds after the Big Bang. Atomic nuclei were created in the process of nucleosynthesis which occurred during the first few minutes of the photon epoch. For the remainder of the photon epoch the Universe contained a hot dense plasma of nuclei, electrons and photons. About 380,000 years after the Big Bang, the temperature of the Universe fell to the point where nuclei could combine with electrons to create neutral atoms. As a result, photons no longer interacted frequently with matter and the Universe became transparent. The highly redshifted photons from this period form the cosmic microwave background. Tiny variations in temperature and density detectable in the CMB were the early “seeds” from which all subsequent structure formation took place. General relativity is the geometric theory of gravitation published by Albert Einstein in 1915 and the current description of gravitation in modern physics. It is the basis of current cosmological models of the Universe. General relativity generalizes special relativity and Newton’s law of universal gravitation, providing a unified description of gravity as a geometric property of space and time, or spacetime. In particular, the curvature of spacetime is directly related to the energy and momentum of whatever matter and radiation are present. The relation is specified by the Einstein field equations, a system of partial differential equations. In general relativity, the distribution of matter and energy determines the geometry of spacetime, which in turn describes the acceleration of matter. Therefore, solutions of the Einstein field equations describe the evolution of the Universe. Combined with measurements of the amount, type, and distribution of matter in the Universe, the equations of general relativity describe the evolution of the Universe over time. where (r, θ, φ) correspond to a spherical coordinate system. This metric has only two undetermined parameters. An overall dimensionless length scale factor R describes the size scale of the Universe as a function of time; an increase in R is the expansion of the Universe. A curvature index k describes the geometry. The index k is defined so that it can be only 0, corresponding to flat Euclidean geometry, 1, corresponding to a space of positive curvature, or −1, a space of positive or negative curvature. The value of R as a function of time t depends upon k and the cosmological constant Λ. The cosmological constant represents the energy density of the vacuum of space and could be related to dark energy. The equation describing how R varies with time is known as the Friedmann equation after its inventor, Alexander Friedmann. The solutions for R(t) depend on k and Λ, but some qualitative features of such solutions are general. First and most importantly, the length scale R of the Universe can remain constant only if the Universe is perfectly isotropic with positive curvature (k=1) and has one precise value of density everywhere, as first noted by Albert Einstein. However, this equilibrium is unstable: because the Universe is known to be inhomogeneous on smaller scales, R must change over time. When R changes, all the spatial distances in the Universe change in tandem; there is an overall expansion or contraction of space itself. This accounts for the observation that galaxies appear to be flying apart; the space between them is stretching. The stretching of space also accounts for the apparent paradox that two galaxies can be 40 billion light years apart, although they started from the same point 13.8 billion years ago and never moved faster than the speed of light. Second, all solutions suggest that there was a gravitational singularity in the past, when R went to zero and matter and energy were infinitely dense. It may seem that this conclusion is uncertain because it is based on the questionable assumptions of perfect homogeneity and isotropy (the cosmological principle) and that only the gravitational interaction is significant. However, the Penrose–Hawking singularity theorems show that a singularity should exist for very general conditions. Hence, according to Einstein’s field equations, R grew rapidly from an unimaginably hot, dense state that existed immediately following this singularity (when R had a small, finite value); this is the essence of the Big Bang model of the Universe. Understanding the singularity of the Big Bang likely requires a quantum theory of gravity, which has not yet been formulated. Third, the curvature index k determines the sign of the mean spatial curvature of spacetime averaged over sufficiently large length scales (greater than about a billion light years). If k=1, the curvature is positive and the Universe has a finite volume. Such universes are often visualized as a three-dimensional sphere embedded in a four-dimensional space. Conversely, if k is zero or negative, the Universe has infinite volume. It may seem counter-intuitive that an infinite and yet infinitely dense Universe could be created in a single instant at the Big Bang when R=0, but exactly that is predicted mathematically when k does not equal 1. 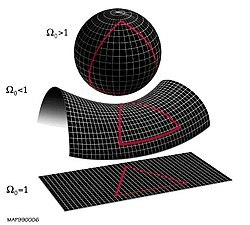 By analogy, an infinite plane has zero curvature but infinite area, whereas an infinite cylinder is finite in one direction and a torus is finite in both. A toroidal Universe could behave like a normal Universe with periodic boundary conditions. The ultimate fate of the Universe is still unknown, because it depends critically on the curvature index k and the cosmological constant Λ. If the Universe were sufficiently dense, k would equal +1, meaning that its average curvature throughout is positive and the Universe will eventually recollapse in a Big Crunch, possibly starting a new Universe in a Big Bounce. Conversely, if the Universe were insufficiently dense, k would equal 0 or −1 and the Universe would expand forever, cooling off and eventually reaching the Big Freeze and the heat death of the Universe. Modern data suggests that the rate of expansion of the Universe is not decreasing, as originally expected, but increasing; if this continues indefinitely, the Universe may eventually reach a Big Rip. Observationally, the Universe appears to be flat (k = 0), with an overall density that is very close to the critical value between recollapse and eternal expansion. Depiction of a multiverse of seven “bubble” universes, which are separate spacetime continua, each having different physical laws, physical constants, and perhaps even different numbers of dimensions or topologies. Some speculative theories have proposed that our Universe is but one of a set of disconnected universes, collectively denoted as the multiverse, challenging or enhancing more limited definitions of the Universe. Scientific multiverse models are distinct from concepts such as alternate planes of consciousness and simulated reality. Max Tegmark developed a four-part classification scheme for the different types of multiverses that scientists have suggested in various problem domains. An example of such a model is the chaotic inflation model of the early universe. Another is the many-worlds interpretation of quantum mechanics. Parallel worlds are generated in a manner similar to quantum superposition and decoherence, with all states of the wave function being realized in separate worlds. Effectively, the multiverse evolves as a universal wavefunction. If the Big Bang that created our multiverse created an ensemble of multiverses, the wave function of the ensemble would be entangled in this sense. The least controversial category of multiverse in Tegmark’s scheme is Level I, which describes distant spacetime events “in our own universe”, but suggests that statistical analysis exploiting the anthropic principle provides an opportunity to test multiverse theories in some cases. If space is infinite, or sufficiently large and uniform, identical instances of the history of Earth’s entire Hubble volume occur every so often, simply by chance. Tegmark calculated our nearest so-called doppelgänger, is 1010115 meters away from us (a double exponential function larger than a googolplex). In principle, it would be impossible to scientifically verify an identical Hubble volume. However, it does follow as a fairly straightforward consequence from otherwise unrelated scientific observations and theories. It is possible to conceive of disconnected spacetimes, each existing but unable to interact with one another. An easily visualized metaphor is a group of separate soap bubbles, in which observers living on one soap bubble cannot interact with those on other soap bubbles, even in principle. According to one common terminology, each “soap bubble” of spacetime is denoted as a universe, whereas our particular spacetime is denoted as the Universe, just as we call our moon the Moon. The entire collection of these separate spacetimes is denoted as the multiverse. With this terminology, different Universes are not causally connected to each other. In principle, the other unconnected Universes may have different dimensionalities and topologies of spacetime, different forms of matter and energy, and different physical laws and physical constants, although such possibilities are purely speculative. Others consider each of several bubbles created as part of chaotic inflation to be separate Universes, though in this model these universes all share a causal origin. Historically, there have been many ideas of the cosmos (cosmologies) and its origin (cosmogonies). Theories of an impersonal Universe governed by physical laws were first proposed by the Greeks and Indians. Ancient Chinese philosophy encompassed the notion of the Universe including both all of space and all of time. Over the centuries, improvements in astronomical observations and theories of motion and gravitation led to ever more accurate descriptions of the Universe. The modern era of cosmology began with Albert Einstein’s 1915 general theory of relativity, which made it possible to quantitatively predict the origin, evolution, and conclusion of the Universe as a whole. Most modern, accepted theories of cosmology are based on general relativity and, more specifically, the predicted Big Bang. Many cultures have stories describing the origin of the world and universe. Cultures generally regard these stories as having some truth. 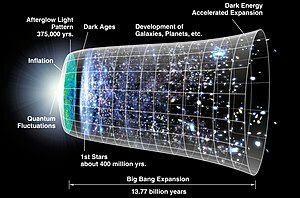 There are however many differing beliefs in how these stories apply amongst those believing in a supernatural origin, ranging from a god directly creating the Universe as it is now to a god just setting the “wheels in motion” (for example via mechanisms such as the big bang and evolution). Ethnologists and anthropologists who study myths have developed various classification schemes for the various themes that appear in creation stories. For example, in one type of story, the world is born from a world egg; such stories include the Finnish epic poem Kalevala, the Chinese story of Pangu or the Indian Brahmanda Purana. In related stories, the Universe is created by a single entity emanating or producing something by him- or herself, as in the Tibetan Buddhism concept of Adi-Buddha, the ancient Greek story of Gaia (Mother Earth), the Aztec goddess Coatlicue myth, the ancient Egyptian god Atum story, and the Judeo-Christian Genesis creation narrative in which the Abrahamic God created the Universe. In another type of story, the Universe is created from the union of male and female deities, as in the Maori story of Rangi and Papa. In other stories, the Universe is created by crafting it from pre-existing materials, such as the corpse of a dead god — as from Tiamat in the Babylonian epic Enuma Elish or from the giant Ymir in Norse mythology – or from chaotic materials, as in Izanagi and Izanami in Japanese mythology. In other stories, the Universe emanates from fundamental principles, such as Brahman and Prakrti, the creation myth of the Serers, or the yin and yang of the Tao. The pre-Socratic Greek philosophers and Indian philosophers developed some of the earliest philosophical concepts of the Universe. The earliest Greek philosophers noted that appearances can be deceiving, and sought to understand the underlying reality behind the appearances. In particular, they noted the ability of matter to change forms (e.g., ice to water to steam) and several philosophers proposed that all the physical materials in the world are different forms of a single primordial material, or arche. The first to do so was Thales, who proposed this material to be water. Thales’ student, Anaximander, proposed that everything came from the limitless apeiron. Anaximenes proposed the primordial material to be air on account of its perceived attractive and repulsive qualities that cause the arche to condense or dissociate into different forms. Anaxagoras proposed the principle of Nous (Mind), while Heraclitus proposed fire (and spoke of logos). Empedocles proposed the elements to be earth, water, air and fire. His four-element model became very popular. Like Pythagoras, Plato believed that all things were composed of number, with Empedocles’ elements taking the form of the Platonic solids. Democritus, and later philosophers—most notably Leucippus—proposed that the Universe is composed of indivisible atoms moving through void (vacuum), although Aristotle did not believe that to be feasible because air, like water, offers resistance to motion. Air will immediately rush in to fill a void, and moreover, without resistance, it would do so indefinitely fast. Although Heraclitus argued for eternal change, his contemporary Parmenides made the radical suggestion that all change is an illusion, that the true underlying reality is eternally unchanging and of a single nature. Parmenides denoted this reality as τὸ ἐν (The One). Parmenides’ idea seemed implausible to many Greeks, but his student Zeno of Elea challenged them with several famous paradoxes. Aristotle responded to these paradoxes by developing the notion of a potential countable infinity, as well as the infinitely divisible continuum. Unlike the eternal and unchanging cycles of time, he believed that the world is bounded by the celestial spheres and that cumulative stellar magnitude is only finitely multiplicative. The Indian philosopher Kanada, founder of the Vaisheshika school, developed a notion of atomism and proposed that light and heat were varieties of the same substance. In the 5th century AD, the Buddhist atomist philosopher Dignāga proposed atoms to be point-sized, durationless, and made of energy. They denied the existence of substantial matter and proposed that movement consisted of momentary flashes of a stream of energy. The notion of temporal finitism was inspired by the doctrine of creation shared by the three Abrahamic religions: Judaism, Christianity and Islam. The Christian philosopher, John Philoponus, presented the philosophical arguments against the ancient Greek notion of an infinite past and future. Philoponus’ arguments against an infinite past were used by the early Muslim philosopher, Al-Kindi (Alkindus); the Jewish philosopher, Saadia Gaon (Saadia ben Joseph); and the Muslim theologian, Al-Ghazali (Algazel). Astronomical models of the Universe were proposed soon after astronomy began with the Babylonian astronomers, who viewed the Universe as a flat disk floating in the ocean, and this forms the premise for early Greek maps like those of Anaximander and Hecataeus of Miletus. Later Greek philosophers, observing the motions of the heavenly bodies, were concerned with developing models of the Universe-based more profoundly on empirical evidence. The first coherent model was proposed by Eudoxus of Cnidos. According to Aristotle’s physical interpretation of the model, celestial spheres eternally rotate with uniform motion around a stationary Earth. Normal matter is entirely contained within the terrestrial sphere. De Mundo (composed before 250 BC or between 350 and 200 BC), stated, Five elements, situated in spheres in five regions, the less being in each case surrounded by the greater — namely, earth surrounded by water, water by air, air by fire, and fire by ether — make up the whole Universe. This model was also refined by Callippus and after concentric spheres were abandoned, it was brought into nearly perfect agreement with astronomical observations by Ptolemy. The success of such a model is largely due to the mathematical fact that any function (such as the position of a planet) can be decomposed into a set of circular functions (the Fourier modes). Other Greek scientists, such as the Pythagorean philosopher Philolaus, postulated (according to Stobaeus account) that at the center of the Universe was a “central fire” around which the Earth, Sun, Moon and Planets revolved in uniform circular motion. The only other astronomer from antiquity known by name who supported Aristarchus’s heliocentric model was Seleucus of Seleucia, a Hellenistic astronomer who lived a century after Aristarchus. According to Plutarch, Seleucus was the first to prove the heliocentric system through reasoning, but it is not known what arguments he used. Seleucus’ arguments for a heliocentric cosmology were probably related to the phenomenon of tides. According to Strabo (1.1.9), Seleucus was the first to state that the tides are due to the attraction of the Moon, and that the height of the tides depends on the Moon’s position relative to the Sun. Alternatively, he may have proved heliocentricity by determining the constants of a geometric model for it, and by developing methods to compute planetary positions using this model, like what Nicolaus Copernicus later did in the 16th century. During the Middle Ages, heliocentric models were also proposed by the Indian astronomerAryabhata, and by the Persian astronomers Albumasar and Al-Sijzi. Model of the Copernican Universe by Thomas Digges in 1576, with the amendment that the stars are no longer confined to a sphere, but spread uniformly throughout the space surrounding the planets. The Aristotelian model was accepted in the Western world for roughly two millennia, until Copernicus revived Aristarchus’s perspective that the astronomical data could be explained more plausibly if the earth rotated on its axis and if the sun were placed at the center of the Universe. In the center rests the Sun. For who would place this lamp of a very beautiful temple in another or better place than this wherefrom it can illuminate everything at the same time? As noted by Copernicus himself, the notion that the Earth rotates is very old, dating at least to Philolaus (c. 450 BC), Heraclides Ponticus (c. 350 BC) and Ecphantus the Pythagorean. Roughly a century before Copernicus, the Christian scholar Nicholas of Cusa also proposed that the Earth rotates on its axis in his book, On Learned Ignorance (1440). Al-Sijzi also proposed that the Earth rotates on its axis. Empirical evidence for the Earth’s rotation on its axis, using the phenomenon of comets, was given by Tusi (1201–1274) and Ali Qushji (1403–1474). This cosmology was accepted by Isaac Newton, Christiaan Huygens and later scientists. Edmund Halley (1720) and Jean-Philippe de Chéseaux (1744) noted independently that the assumption of an infinite space filled uniformly with stars would lead to the prediction that the nighttime sky would be as bright as the Sun itself; this became known as Olbers’ paradox in the 19th century. Newton believed that an infinite space uniformly filled with matter would cause infinite forces and instabilities causing the matter to be crushed inwards under its own gravity. This instability was clarified in 1902 by the Jeans instability criterion. One solution to these paradoxes is the Charlier Universe, in which the matter is arranged hierarchically (systems of orbiting bodies that are themselves orbiting in a larger system, ad infinitum) in a fractal way such that the Universe has a negligibly small overall density; such a cosmological model had also been proposed earlier in 1761 by Johann Heinrich Lambert.A significant astronomical advance of the 18th century was the realization by Thomas Wright, Immanuel Kant and others of nebulae. The modern era of physical cosmology began in 1917, when Albert Einstein first applied his general theory of relativity to model the structure and dynamics of the Universe. Jump up^ “Hubble’s Deepest View of Universe Unveils Never-Before-Seen Galaxies”. HubbleSite.org. Retrieved 2016-01-02. ^ Jump up to:a b c Planck Collaboration (2015). “Planck 2015 results. XIII. Cosmological parameters (See Table 4 on page 31 of pfd).”. Astronomy & Astrophysics. 594: A13. arXiv:1502.01589 . Bibcode:2016A&A…594A..13P. doi:10.1051/0004-6361/201525830. Jump up^ Itzhak Bars; John Terning (2009). Extra Dimensions in Space and Time. Springer. pp. 27ff. ISBN 978-0-387-77637-8. Retrieved 2011-05-01. Jump up^ Paul Davies (2006). The Goldilocks Enigma. First Mariner Books. p. 43ff. ISBN 978-0-618-59226-5. Retrieved 2013-07-01. ^ Jump up to:a b NASA/WMAP Science Team (24 January 2014). “Universe 101: What is the Universe Made Of?”. NASA. Retrieved 2015-02-17. ^ Jump up to:a b Fixsen, D. J. (2009). “The Temperature of the Cosmic Microwave Background”. The Astrophysical Journal. 707 (2): 916–920. arXiv:0911.1955 . Bibcode:2009ApJ…707..916F. doi:10.1088/0004-637X/707/2/916. ^ Jump up to:a b c “First Planck results: the Universe is still weird and interesting”. Matthew Francis. Ars technica. 2013-03-21. Retrieved 2015-08-21. Jump up^ NASA/WMAP Science Team (24 January 2014). “Universe 101: Will the Universe expand forever?”. NASA. Retrieved 16 April 2015. Jump up^ Universe. Webster’s New World College Dictionary, Wiley Publishing, Inc. 2010. Jump up^ “Universe”. Dictionary.com. Retrieved 2012-09-21. Jump up^ “Universe”. Merriam-Webster Dictionary. Retrieved 2012-09-21. Jump up^ Zeilik, Michael; Gregory, Stephen A. (1998). Introductory Astronomy & Astrophysics (4th ed.). Saunders College Publishing. ISBN 0030062284. The totality of all space and time; all that is, has been, and will be. Jump up^ Dold-Samplonius, Yvonne (2002). From China to Paris: 2000 Years Transmission of Mathematical Ideas. Franz Steiner Verlag. ^ Jump up to:a b c d Thomas F. Glick; Steven Livesey; Faith Wallis. Medieval Science Technology and Medicine: An Encyclopedia. Routledge. Jump up^ Hawking, Stephen (1988). A Brief History of Time. Bantam Books. p. 125. ISBN 0-553-05340-X. ^ Jump up to:a b “The Nobel Prize in Physics 2011”. Retrieved 16 April 2015. ^ Jump up to:a b c d e f g Ellis, George F.R. ; U. Kirchner; W.R. Stoeger (2004). “Multiverses and physical cosmology”. Monthly Notices of the Royal Astronomical Society. 347 (3): 921–936. arXiv:astro-ph/0305292 . Bibcode:2004MNRAS.347..921E. doi:10.1111/j.1365-2966.2004.07261.x. Jump up^ Palmer, Jason. (2011-08-03) BBC News – ‘Multiverse’ theory suggested by microwave background. Retrieved 2011-11-28. Jump up^ Paul Copan; William Lane Craig (2004). Creation Out of Nothing: A Biblical, Philosophical, and Scientific Exploration. Baker Academic. p. 220. ISBN 9780801027338. Jump up^ Alexander Bolonkin (November 2011). Universe, Human Immortality and Future Human Evaluation. Elsevier. pp. 3–. ISBN 978-0-12-415801-6. Jump up^ Duco A. Schreuder (3 December 2014). Vision and Visual Perception. Archway Publishing. pp. 135–. ISBN 978-1-4808-1294-9. Jump up^ Jim Holt (2012). Why Does the World Exist?. Liveright Publishing. p. 308. Jump up^ Timothy Ferris (1997). The Whole Shebang: A State-of-the-Universe(s) Report. Simon & Schuster. p. 400. Jump up^ The Compact Edition of the Oxford English Dictionary, volume II, Oxford: Oxford University Press, 1971, p. 3518. Jump up^ Lewis, C. T. and Short, S (1879) A Latin Dictionary, Oxford University Press, ISBN 0-19-864201-6, pp. 1933, 1977–1978. Jump up^ Lewis, C. T.; Short, S (1879). A Latin Dictionary. Oxford University Press. pp. 1881–1882, 1175, 1189–1190. ISBN 0-19-864201-6. Jump up^ The Compact Edition of the Oxford English Dictionary. II. Oxford: Oxford University Press. 1971. pp. 909, 569, 3821–3822, 1900. ISBN 978-0198611172. Jump up^ Joseph Silk (2009). Horizons of Cosmology. Templeton Pressr. p. 208. Jump up^ Simon Singh (2005). Big Bang: The Origin of the Universe. Harper Perennial. p. 560. Jump up^ C. Sivaram (1986). “Evolution of the Universe through the Planck epoch”. Astrophysics & Space Science. 125: 189–199. Bibcode:1986Ap&SS.125..189S. doi:10.1007/BF00643984. Jump up^ Richard B. Larson & Volker Bromm (March 2002). “The First Stars in the Universe”. Scientific American. Jump up^ Brill, Dieter; Jacobsen, Ted (2006). “Spacetime and Euclidean geometry”. General Relativity and Gravitation. 38: 643–651. arXiv:gr-qc/0407022 . Bibcode:2006GReGr..38..643B. doi:10.1007/s10714-006-0254-9. Jump up^ “Antimatter”. Particle Physics and Astronomy Research Council. October 28, 2003. Archived from the original on March 7, 2004. Retrieved 2006-08-10. Jump up^ Edward Robert Harrison (2000). Cosmology: the science of the universe. Cambridge University Press. pp. 447–. ISBN 978-0-521-66148-5. Retrieved 1 May 2011. Jump up^ Andrew R. Liddle; David Hilary Lyth (13 April 2000). Cosmological inflation and large-scale structure. Cambridge University Press. pp. 24–. ISBN 978-0-521-57598-0. Retrieved 1 May 2011. Jump up^ “What is the Ultimate Fate of the Universe?”. National Aeronautics and Space Administration. NASA. Retrieved 23 August 2015. Jump up^ Will the Universe expand forever?, WMAP website at NASA. ^ Jump up to:a b Luminet, Jean-Pierre; Weeks, Jeffrey R.; Riazuelo, Alain; Lehoucq, Roland; Uzan, Jean-Philippe (2003-10-09). “Dodecahedral space topology as an explanation for weak wide-angle temperature correlations in the cosmic microwave background”. Nature. 425 (6958): 593–5. arXiv:astro-ph/0310253 . Bibcode:2003Natur.425..593L. doi:10.1038/nature01944. PMID 14534579. Jump up^ Roukema, Boudewijn; Zbigniew Buliński; Agnieszka Szaniewska; Nicolas E. Gaudin (2008). “A test of the Poincare dodecahedral space topology hypothesis with the WMAP CMB data”. Astronomy and Astrophysics. 482 (3): 747–753. arXiv:0801.0006 . Bibcode:2008A&A…482..747L. doi:10.1051/0004-6361:20078777. Jump up^ Aurich, Ralf; Lustig, S.; Steiner, F.; Then, H. (2004). “Hyperbolic Universes with a Horned Topology and the CMB Anisotropy”. Classical and Quantum Gravity. 21 (21): 4901–4926. arXiv:astro-ph/0403597 . Bibcode:2004CQGra..21.4901A. doi:10.1088/0264-9381/21/21/010. Jump up^ Planck collaboration (2014). “Planck 2013 results. XVI. Cosmological parameters”. Astronomy & Astrophysics. 571: A16. arXiv:1303.5076 . Bibcode:2014A&A…571A..16P. doi:10.1051/0004-6361/201321591. Jump up^ “Planck reveals ‘almost perfect’ universe”. Michael Banks. Physics World. 2013-03-21. Retrieved 2013-03-21. Jump up^ McCall, Storrs. A Model of the Universe: Space-time, Probability, and Decision. Oxford University. p. 23. Jump up^ Michio Kaku (11 March 2008). Physics of the Impossible: A Scientific Exploration into the World of Phasers, Force Fields, Teleportation, and Time Travel. Knopf Doubleday Publishing Group. pp. 202–. ISBN 978-0-385-52544-2. Jump up^ Christopher Crockett (February 20, 2013). “What is a light-year?”. EarthSky. ^ Jump up to:a b Rindler ,p. 196. Jump up^ Christian, Eric; Samar, Safi-Harb. “How large is the Milky Way?”. Retrieved 2007-11-28. Jump up^ I. Ribas; C. Jordi; F. Vilardell; E.L. Fitzpatrick; R.W. Hilditch; F. Edward Guinan (2005). “First Determination of the Distance and Fundamental Properties of an Eclipsing Binary in the Andromeda Galaxy”. Astrophysical Journal. 635 (1): L37–L40. arXiv:astro-ph/0511045 . Bibcode:2005ApJ…635L..37R. doi:10.1086/499161. McConnachie, A. W.; Irwin, M. J.; Ferguson, A. M. N.; Ibata, R. A.; Lewis, G. F.; Tanvir, N. (2005). “Distances and metallicities for 17 Local Group galaxies”. Monthly Notices of the Royal Astronomical Society. 356 (4): 979–997. arXiv:astro-ph/0410489 . Bibcode:2005MNRAS.356..979M. doi:10.1111/j.1365-2966.2004.08514.x. Jump up^ Brian Greene (2011). The Hidden Reality. Alfred A. Knopf. Jump up^ “How can space travel faster than the speed of light?”. Vannesa Janek. Universe Today. 20 February 2015. Retrieved 6 June 2015. Jump up^ “Is faster-than-light travel or communication possible? Section: Expansion of the Universe”. Philip Gibbs. 1997. Retrieved 6 June 2015. Jump up^ Phil Berardelli (March 25, 2010). “Galaxy Collisions Give Birth to Quasars”. Science News. Jump up^ Riess, Adam G.; Filippenko; Challis; Clocchiatti; Diercks; Garnavich; Gilliland; Hogan; Jha; Kirshner; Leibundgut; Phillips; Reiss; Schmidt; Schommer; Smith; Spyromilio; Stubbs; Suntzeff; Tonry (1998). “Observational evidence from supernovae for an accelerating universe and a cosmological constant”. Astronomical Journal. 116 (3): 1009–38. arXiv:astro-ph/9805201 . Bibcode:1998AJ….116.1009R. doi:10.1086/300499. Jump up^ Perlmutter, S.; Aldering; Goldhaber; Knop; Nugent; Castro; Deustua; Fabbro; Goobar; Groom; Hook; Kim; Kim; Lee; Nunes; Pain; Pennypacker; Quimby; Lidman; Ellis; Irwin; McMahon; Ruiz‐Lapuente; Walton; Schaefer; Boyle; Filippenko; Matheson; Fruchter; et al. (1999). “Measurements of Omega and Lambda from 42 high redshift supernovae”. Astrophysical Journal. 517 (2): 565–86. arXiv:astro-ph/9812133 . Bibcode:1999ApJ…517..565P. doi:10.1086/307221. Jump up^ Sean Carroll and Michio Kaku (2014). How the Universe Works 3. End of the Universe. Discovery Channel. Jump up^ Overbye, Dennis (October 11, 2003). “A ‘Cosmic Jerk’ That Reversed the Universe”. New York Times. Jump up^ Schutz, Bernard (May 31, 2009). A First Course in General Relativity (2 ed.). Cambridge University Press. p. 142 & 171. ISBN 0-521-88705-4. Jump up^ WMAP Mission: Results – Age of the Universe. Map.gsfc.nasa.gov. Retrieved 2011-11-28. Jump up^ Luminet, Jean-Pierre; Boudewijn F. Roukema (1999). “Topology of the Universe: Theory and Observations”. Proceedings of Cosmology School held at Cargese, Corsica, August 1998. arXiv:astro-ph/9901364 . Jump up^ Fritzsche, Hellmut. “electromagnetic radiation | physics”. Encyclopedia Britannica. p. 1. Retrieved 2015-07-26. Jump up^ “Physics 7:Relativity, SpaceTime and Cosmology” (PDF). Physics 7:Relativity, SpaceTime and Cosmology. University of California Riverside. Retrieved 2015-07-26. Jump up^ “Physics – for the 21st Century”. http://www.learner.org. Harvard-Smithsonian Center for Astrophysics Annenberg Learner. Retrieved 2015-07-27. Jump up^ Redd,SPACE.com, Nola Taylor. “It’s Official: The Universe Is Dying Slowly”. Retrieved 2015-08-11. Jump up^ “RIP Universe – Your Time Is Coming… Slowly | Video”. Will Parr, et al. Space.com. Retrieved 2015-08-20. Jump up^ “Dark matter – A history shapes by dark force”. Timothy Ferris. National Geographic. 2015. Retrieved 2015-12-29. ^ Jump up to:a b Peebles, P. J. E. & Ratra, Bharat (2003). “The cosmological constant and dark energy”. Reviews of Modern Physics. 75 (2): 559–606. arXiv:astro-ph/0207347 . Bibcode:2003RvMP…75..559P. doi:10.1103/RevModPhys.75.559. Jump up^ Mandolesi, N.; Calzolari, P.; Cortiglioni, S.; Delpino, F.; Sironi, G.; Inzani, P.; Deamici, G.; Solheim, J. -E.; Berger, L.; Partridge, R. B.; Martenis, P. L.; Sangree, C. H.; Harvey, R. C. (1986). “Large-scale homogeneity of the Universe measured by the microwave background”. Nature. 319 (6056): 751–753. Bibcode:1986Natur.319..751M. doi:10.1038/319751a0. Jump up^ “The Structure of the Universe”. Jump up^ Mackie, Glen (February 1, 2002). “To see the Universe in a Grain of Taranaki Sand”. Swinburne University. Retrieved 2006-12-20. Jump up^ “Unveiling the Secret of a Virgo Dwarf Galaxy”. ESO. 2000-05-03. Retrieved 2007-01-03. Jump up^ “Hubble’s Largest Galaxy Portrait Offers a New High-Definition View”. NASA. 2006-02-28. Retrieved 2007-01-03. Jump up^ “Earth’s new address: ‘Solar System, Milky Way, Laniakea'”. Elizabeth Gibney. Nature. 3 September 2014. Retrieved 21 August 2015. Jump up^ “Local Group”. Fraser Cain. Universe Today. 4 May 2009. Retrieved 21 August 2015. Jump up^ “Astronomers discover largest known structure in the universe is … a big hole”. The Guardian. 20 April 2015. Jump up^ “Content of the Universe – WMAP 9yr Pie Chart”. wmap.gsfc.nasa.gov. Retrieved 2015-07-26. Jump up^ Rindler, p. 202. Jump up^ Andrew Liddle (2003). An Introduction to Modern Cosmology (2nd ed.). John Wiley & Sons. ISBN 978-0-470-84835-7. . p. 2. Jump up^ Livio, Mario (2001). The Accelerating Universe: Infinite Expansion, the Cosmological Constant, and the Beauty of the Cosmos. John Wiley and Sons. p. 53. Retrieved 31 March 2012. Jump up^ Peebles, P. J. E. & Ratra, Bharat (2003). “The cosmological constant and dark energy”. Reviews of Modern Physics. 75 (2): 559–606. arXiv:astro-ph/0207347 . Bibcode:2003RvMP…75..559P. doi:10.1103/RevModPhys.75.559. Jump up^ Paul J. Steinhardt, Neil Turok (2006). “Why the cosmological constant is small and positive”. Science. 312 (5777): 1180–1183. arXiv:astro-ph/0605173 . Bibcode:2006Sci…312.1180S. doi:10.1126/science.1126231. Jump up^ “Dark Energy”. Hyperphysics. Retrieved January 4, 2014. Jump up^ Carroll, Sean (2001). “The cosmological constant”. Living Reviews in Relativity. 4. doi:10.12942/lrr-2001-1. Retrieved 2006-09-28. Jump up^ “Planck captures portrait of the young Universe, revealing earliest light”. University of Cambridge. 21 March 2013. Retrieved 21 March 2013. Jump up^ P. Davies (1992). The New Physics: A Synthesis. Cambridge University Press. p. 1. ISBN 0-521-43831-4. Jump up^ Persic, Massimo; Salucci, Paolo (1992-09-01). “The baryon content of the Universe”. Monthly Notices of the Royal Astronomical Society. 258 (1): 14P–18P. arXiv:astro-ph/0502178 . Bibcode:1992MNRAS.258P..14P. doi:10.1093/mnras/258.1.14P. ISSN 0035-8711. Jump up^ G. ‘t Hooft (1997). In search of the ultimate building blocks. Cambridge University Press. p. 6. ISBN 0-521-57883-3. Jump up^ Clayton, Donald D. (1983). Principles of Stellar Evolution and Nucleosynthesis. The University of Chicago Press. pp. 362–435. ISBN 0-226-10953-4. Jump up^ Veltman, Martinus (2003). Facts and Mysteries in Elementary Particle Physics. World Scientific. ISBN 981-238-149-X. ^ Jump up to:a b Sylvie Braibant; Giorgio Giacomelli; Maurizio Spurio (2012). Particles and Fundamental Interactions: An Introduction to Particle Physics (2nd ed.). Springer. pp. 1–3. ISBN 978-94-007-2463-1. Jump up^ Close, Frank (2012). Particle Physics: A Very Short Introduction. Oxford University Press. ISBN 978-0192804341. ^ Jump up to:a b R. Oerter (2006). The Theory of Almost Everything: The Standard Model, the Unsung Triumph of Modern Physics (Kindle ed.). Penguin Group. p. 2. ISBN 0-13-236678-9. Jump up^ Onyisi, P. (23 October 2012). “Higgs boson FAQ”. University of Texas ATLAS group. Retrieved 2013-01-08. Jump up^ Strassler, M. (12 October 2012). “The Higgs FAQ 2.0”. ProfMattStrassler.com. Retrieved 2013-01-08. [Q] Why do particle physicists care so much about the Higgs particle? Jump up^ Steven Weinberg. Dreams of a Final Theory: The Scientist’s Search for the Ultimate Laws of Nature. Knopf Doubleday Publishing Group. ISBN 978-0-307-78786-6. ^ Jump up to:a b Allday, Jonathan (2002). Quarks, Leptons and the Big Bang (Second ed.). IOP Publishing. ISBN 0-7503-0806-0. Jump up^ “Lepton (physics)”. Encyclopædia Britannica. Retrieved 2010-09-29. Jump up^ Harari, H. (1977). “Beyond charm”. In Balian, R.; Llewellyn-Smith, C.H. Weak and Electromagnetic Interactions at High Energy, Les Houches, France, Jul 5- Aug 14, 1976. Les Houches Summer School Proceedings. 29. North-Holland. p. 613. Jump up^ Harari H. (1977). “Three generations of quarks and leptons” (PDF). In E. van Goeler; Weinstein R. Proceedings of the XII Rencontre de Moriond. p. 170. SLAC-PUB-1974. Jump up^ “Experiment confirms famous physics model” (Press release). MIT News Office. 18 April 2007. Jump up^ “Thermal history of the Universe and early growth of density fluctuations” (PDF). Guinevere Kauffmann. Max Planck Institute for Astrophysics. Retrieved 2016-01-06. Jump up^ “First few minutes”. Eric Chaisson. Havard Smithsonian Center for Astrophysics. Retrieved 2016-01-06. Jump up^ “Timeline of the Big Bang”. The physics of the Universe. Retrieved 2016-01-06. ^ Jump up to:a b c d Zeilik, Michael; Gregory, Stephen A. (1998). “25-2”. Introductory Astronomy & Astrophysics (4th ed.). Saunders College Publishing. ISBN 0030062284. Jump up^ Friedmann A. (1922). “Über die Krümmung des Raumes” (PDF). Zeitschrift für Physik. 10 (1): 377–386. Bibcode:1922ZPhy…10..377F. doi:10.1007/BF01332580. Jump up^ “Cosmic Detectives”. The European Space Agency (ESA). 2013-04-02. Retrieved 2013-04-15. Jump up^ Munitz MK (1959). “One Universe or Many?”. Journal of the History of Ideas. 12 (2): 231–255. doi:10.2307/2707516. JSTOR 2707516. Jump up^ Linde A. (1986). “Eternal chaotic inflation”. Mod. Phys. Lett. A1 (2): 81–85. Bibcode:1986MPLA….1…81L. doi:10.1142/S0217732386000129. Linde A. (1986). “Eternally existing self-reproducing chaotic inflationary Universe” (PDF). Phys. Lett. B175 (4): 395–400. Bibcode:1986PhLB..175..395L. doi:10.1016/0370-2693(86)90611-8. Retrieved 2011-03-17. Jump up^ Everett, Hugh (1957). “Relative State Formulation of Quantum Mechanics”. Reviews of Modern Physics. 29: 454–462. Bibcode:1957RvMP…29..454E. doi:10.1103/RevModPhys.29.454. ^ Jump up to:a b Tegmark M. (2003). “Parallel universes. Not just a staple of science fiction, other universes are a direct implication of cosmological observations”. Scientific American. 288 (5): 40–51. doi:10.1038/scientificamerican0503-40. PMID 12701329. Jump up^ Tegmark, Max (2003). J. D. Barrow; P.C.W. Davies; C.L. Harper, eds. “Parallel Universes”. Scientific American: “Science and Ultimate Reality: from Quantum to Cosmos”, honoring John Wheeler’s 90th birthday. Cambridge University Press. 288: 2131. arXiv:astro-ph/0302131 . Bibcode:2003astro.ph..2131T. doi:10.1038/scientificamerican0503-40. PMID 12701329. Jump up^ Ellis G. F (2011). “Does the Multiverse Really Exist?”. Scientific American. 305 (2): 38–43. doi:10.1038/scientificamerican0811-38. Jump up^ Clara Moskowitz (August 12, 2011). “Weird! Our Universe May Be a ‘Multiverse,’ Scientists Say”. livescience. Jump up^ Mark Isaak (ed.) (2005). “CI301: The Anthropic Principle”. Index to Creationist Claims. TalkOrigins Archive. Retrieved 2007-10-31. Jump up^ Gernet, J. (1993–1994). “Space and time: Science and religion in the encounter between China and Europe”. Chinese Science. 11. pp. 93–102. Jump up^ Ng, Tai (2007). “III.3”. Chinese Culture, Western Culture: Why Must We Learn from Each Other?. iUniverse, Inc.
Jump up^ Blandford R. D. “A century of general relativity: Astrophysics and cosmology”. Science. 347 (6226): 1103–1108. Bibcode:2015Sci…347.1103B. doi:10.1126/science.aaa4033. PMID 25745165. Jump up^ Leeming, David A. (2010). Creation Myths of the World. ABC-CLIO. p. xvii. ISBN 978-1-59884-174-9. In common usage the word ‘myth’ refers to narratives or beliefs that are untrue or merely fanciful; the stories that make up national or ethnic mythologies describe characters and events that common sense and experience tell us are impossible. Nevertheless, all cultures celebrate such myths and attribute to them various degrees of literal or symbolic truth. Jump up^ Eliade, Mircea (1964). Myth and Reality (Religious Traditions of the World). Allen & Unwin. ISBN 978-0-04-291001-7. Jump up^ Leonard, Scott A.; McClure, Michael (2004). Myth and Knowing: An Introduction to World Mythology (1st ed.). McGraw-Hill. ISBN 978-0-7674-1957-4. Jump up^ B. Young, Louise. The Unfinished Universe. Oxford University Press. p. 21. Jump up^ Donald Wayne Viney (1985). “The Cosmological Argument”. Charles Hartshorne and the Existence of God. SUNY Press. pp. 65–68. ISBN 0-87395-907-8. Jump up^ Aristotle; Forster, E. S. (Edward Seymour), 1879–1950; Dobson, J. F. (John Frederic), 1875–1947 (1914). De Mundo. p. 2. Jump up^ Boyer, C. (1968) A History of Mathematics. Wiley, p. 54. Jump up^ William P. D. Wightman (1951, 1953), The Growth of Scientific Ideas, Yale University Press p. 38, where Wightman calls him Seleukos the Chaldean. Jump up^ Lucio Russo, Flussi e riflussi, Feltrinelli, Milano, 2003, ISBN 88-07-10349-4. Jump up^ Nasr, Seyyed H. (1993) . An Introduction to Islamic Cosmological Doctrines (2nd ed.). 1st edition by Harvard University Press, 2nd edition by State University of New York Press. pp. 135–6. ISBN 0-7914-1515-5. Jump up^ Misner, Thorne and Wheeler, p. 754. Jump up^ Ālī, Ema Ākabara. Science in the Quran. 1. Malik Library. p. 218. ^ Jump up to:a b Misner, Thorne and Wheeler, p. 755–756. ^ Jump up to:a b Misner, Thorne and Wheeler, p. 756. Jump up^ de Cheseaux JPL (1744). Traité de la Comète. Lausanne. pp. 223ff. . Reprinted as Appendix II in Dickson FP (1969). The Bowl of Night: The Physical Universe and Scientific Thought. Cambridge, MA: M.I.T. Press. ISBN 978-0-262-54003-2. Jump up^ Olbers HWM (1826). “Unknown title”. Bode’s Jahrbuch. 111. . Reprinted as Appendix I in Dickson FP (1969). The Bowl of Night: The Physical Universe and Scientific Thought. Cambridge, MA: M.I.T. Press. ISBN 978-0-262-54003-2. Jump up^ Jeans, J. H. (1902). “The Stability of a Spherical Nebula” (PDF). Philosophical Transactions of the Royal Society A. 199 (312–320): 1–53. Bibcode:1902RSPTA.199….1J. doi:10.1098/rsta.1902.0012. JSTOR 90845. Archived from the original (PDF) on July 20, 2011. Retrieved 2011-03-17. Jump up^ Misner, Thorne and Wheeler, p. 757. Jump up^ Einstein, A (1917). “Kosmologische Betrachtungen zur allgemeinen Relativitätstheorie”. Preussische Akademie der Wissenschaften, Sitzungsberichte. 1917. (part 1): 142–152. Bartel, Leendert van der Waerden (1987). “The Heliocentric System in Greek, Persian and Hindu Astronomy”. Annals of the New York Academy of Sciences. 500 (1): 525–545. Bibcode:1987NYASA.500..525V. doi:10.1111/j.1749-6632.1987.tb37224.x. Landau L, Lifshitz E (1975). The Classical Theory of Fields (Course of Theoretical Physics). 2 (revised 4th English ed.). New York: Pergamon Press. pp. 358–397. ISBN 978-0-08-018176-9. Liddell, H. G. & Scott, R. (1968). A Greek-English Lexicon. Oxford University Press. ISBN 0-19-864214-8. Misner, C.W., Thorne, Kip, Wheeler, J.A. (1973). Gravitation. San Francisco: W. H. Freeman. pp. 703–816. ISBN 978-0-7167-0344-0. Raine, D. J.; Thomas, E. G. (2001). An Introduction to the Science of Cosmology. Institute of Physics Publishing. Rindler, W. (1977). Essential Relativity: Special, General, and Cosmological. New York: Springer Verlag. pp. 193–244. ISBN 0-387-10090-3. Martin Rees, ed. (2012). Smithsonian Universe (2nd ed.). London: Dorling Kindersley. ISBN 978-0-7566-9841-6.